Miles vs Cashback Cards – Which is better? This is a challenge. An ultimate showdown. The one you’ve been waiting for (since it was first mentioned on 2 Nov in this post, to be exact). 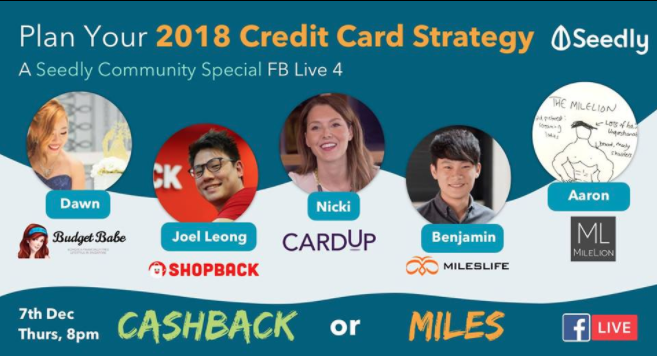 As some of you might have already heard, there’s a crackpot in town known as Aaron Wong (MileLion), who has been going around calling us cashback folks “fools” and “noobs”. Read his piece here: ST writer prefers cashback to miles, fluffy kittens everywhere die. He’s not the only one, by the way. Talk to a miles hacker and they’ll most likely call you silly as well. Here’s the event page with details on our upcoming debate. 2018 is just around the corner. You should definitely review your credit card strategy! We’ve invited a panel of miles and cashback hacking legends to share their ideas. Because hey, who’s gonna stand up for the cashback folks? P.S. Let me know in the comments below which is your favourite miles or cashback credit card(s), and I’ll try to touch on them during the discussion!